A strip of land between Myanmar to the West and Thai Upper Gulf to the East. Many people first see the Upper Gulf area of Thailand out of the window of bus from Bangkok driving to the Andaman coast. Highway 4 - the main route from Bangkok to the South - allows scenic views of the lush countryside, with the unseen expanse of beautiful coastline shrouded with greenery and or enchanting buildings. Travelling from Bangkok, Myanmar is on the left - far enough away not to be seen. In any event there is the expansive mountain range that stretches the whole length of the area - from Phetchaburi at the northern end, down to and through Chumphon province at the south. The mountain range is part of the Tenasserim mountain range. This range of mountains has much to answer for - most of it good. It is also blessed with some alluring national park areas. More of the mountains later. The Province of Phetchaburi is the northernmost province of the Upper Gulf - and much of its popularity id gained - rightfully - by being just about 50kms south of Bangkok. It has a rich and varied historical past - dating back to the 11th century - and being home to Mon, Ayutthaya and Khmer have populated it over the years. It is (was) directly en route for the Burmese on way to Bangkok peacefully, or otherwise during the course of its history. It has a wide range of accommodation units to house the weekenders and others. Khiri Khan Province is home to Hua Hin amongst many other beautiful areas. The Highway 4 runs through to Hua Hin, and is beautifully maintained until that point. 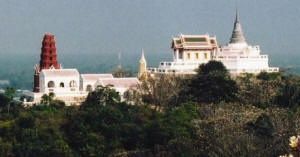 Hua Hin has been a holiday retreat for some of the The Royal Family for many a year. That point alone, makes it a 'must' for weekending Bankokians. This region in Pratchuap Khiri Khan has a wealth of beaches and many historical and scenic attractions that make this a worthwhile visiting area. Do it before it gets too popular as it certainly will do. Last province before reaching the Southern Gulf of Thailand area is an area of outstanding natural beauty and will endear itself to those who like it a little quieter. This is not to say that there is nothing to do in this southernmost area of the Upper Gulf of Thailand. Beaches and the inevitable water sports abound. Normally secluded and quiet during midweek, but like all other areas of beauty and 'things' Chumphon Province is alive at weekends.